Holiday party season continues, as does my love affair with 1950s fashion. It truly is my favourite decade for feminine style, followed closely by the 1940s. 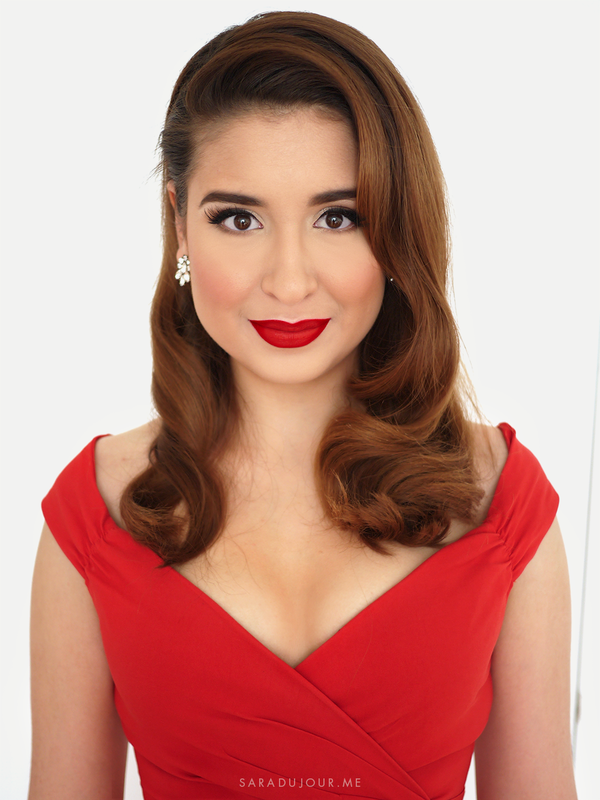 That’s why I combined a 1940s Rita Hayworth-inspired hairstyle with a 1950s Marilyn Monroe-inspired little red dress for this glamourous evening look. For this formal Christmas party outfit, I pulled one of my all-time favourite dresses out of my closet. I almost never do this, but I adore this dress so much, I actually have it in black, too. It’s made of a thick enough material to be flattering to your curves rather than clingy, and hits me just below the knee. (I’m 5’7″.) It’s the perfect va-va-voom retro wiggle dress. Because the dress pops all by itself, I kept the rest of my jewelry minimal, going only with a pair of sparkly rhinestone stud earrings. My nails and lips were red to match the dress, but I’ll get more in depth about my makeup later. If there’s ever a time to get away with excessive glitz and glamour, it’s the holidays, so I wore my sparkly champagne heels to complete the look. 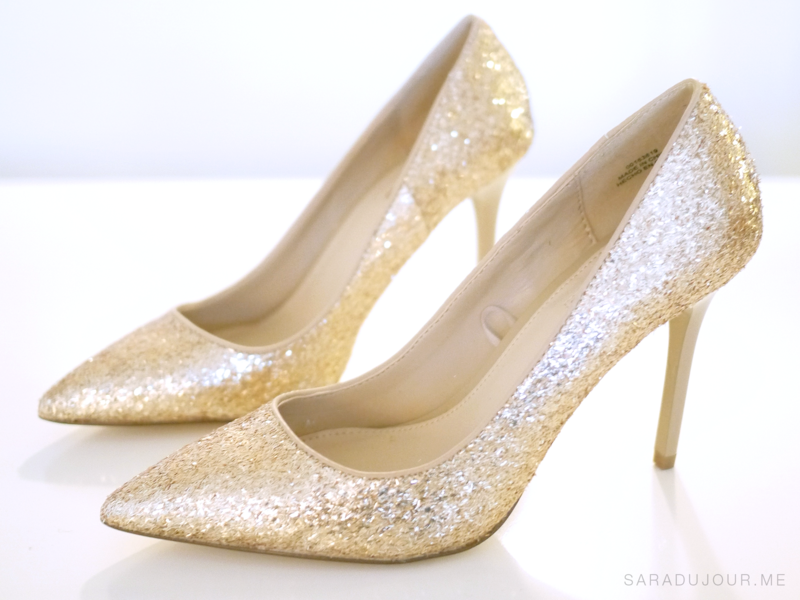 You may remember these Cinderella shoes from my Forever 21 Accessories Haul. Despite being glittery, because they are a neutral colour, they blend in nicely with my skin tone, elongating my legs and not drawing too much attention away from the dress. I’ve been loving soft S-waves this season, so I did my hair very similarly as I did in my Retro 1950s Christmas Party Outfit. I used my Nume 32 mm magic wand to curl all of my hair inwards in big sections, and used velcro rollers and hairspray to help the curls set. Once they did, I lightly brushed all the curls together, and pinned back one side with bobby pins. For makeup, I used a shimmering champagne shadow all over my lid with a warm brown shade two shades darker than my skin tone to subtly contour my crease. Then I added a flick of black liquid liner, and used House of Lashes “Siren” lashes, cut in halves, on the outer corners of each eye to up the glamour and amplify the cat eye. On my lips, I’m wearing Sephora’s liquid lipstick, which is an absolute favourite of mine, combined with a slightly darker red lip liner just around the edges to create a more three-dimensional ombre effect. This colour combination is just so perfect for a New Year party! I agree that the pumps is an excellent investment piece – it’s totally worthy to pull out once in a while but won’t be a distraction to the rest of the look!